STScI-PRC2006-46 - Two galaxies are squaring off in Corvus and here are the latest pictures. 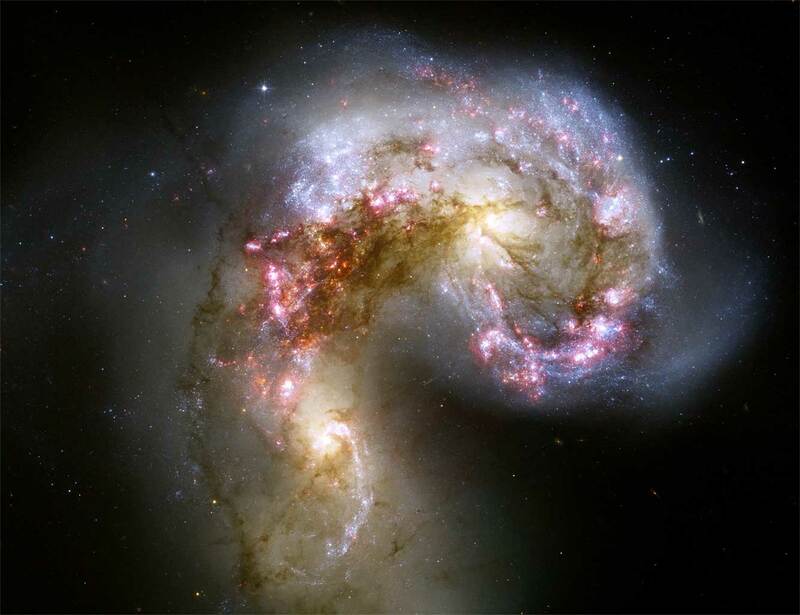 When two galaxies collide, however, the stars that compose them usually do not. This is because galaxies are mostly empty space and, however bright, stars only take up only a small amount of that space. During the slow, hundred million year collision, however, one galaxy can rip the other apart gravitationally, and dust and gas common to both galaxies does collide. In the above clash of the titans, dark dust pillars mark massive molecular clouds are being compressed during the galactic encounter, causing the rapid birth of millions of stars, some of which are gravitationally bound together in massive star clusters.